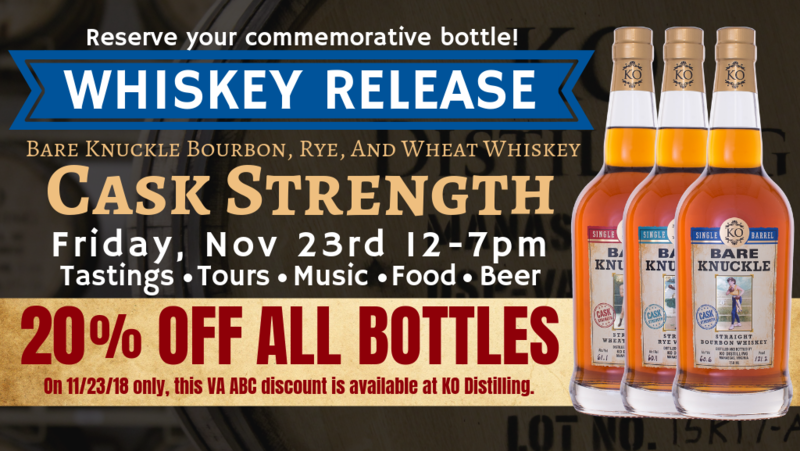 Join KO Distilling from 12pm – 7pm on Friday, November 23rd for the commemorative official public release of our six new Bare Knuckle Single Barrel products. We will be releasing Cask Strength (118-125 Proof) and 90 Proof versions of our Single Barrel Bare Knuckle Straight Wheat, Straight Rye and Straight Bourbon Whiskeys. Spirit tastings, distillery tours, local craft beer, food, music and more will be available for purchase. Each of these Single Barrel whiskeys is hand selected, in LIMITED supply, and ONLY available at the distillery. “Cask Strength” versions are bottled directly from the barrel, without dilution and can range from ~118 to ~125 Proof! Bottling our Bare Knuckle Whiskeys at this higher proof produces a wonderful depth of flavor and heat. The 90 Proof Single Barrel Whiskeys are also fantastic. If that doesn’t wet your whistle, this just might: On BLACK FRIDAY ONLY, ALL SPIRITS WILL BE 20% OFF regular price, including these 6 new Single Barrel Products. Purchases made at the distillery before or after Black Friday will be at regular ABC prices. Reserve your commemorative bottle today, and be among the first to purchase these new products on November 23rd. All bottles sold on November 23rd will have a special commemorative label indicating it’s “Single Barrel” and a unique bottle number along with handwritten signatures from Co-founders Bill Karlson and John O’Mara. Our Bare Knuckle Single Barrel Whiskeys will not be available in VA ABC or DC/MD/DE stores until a later time. Thank you very much for your support, and as always, DrinKO responsibly!